In my opinion, this was a great feud. Having a new wrestler come in and manhandle a well-known and well-loved character like the Undertaker was a risk that paid off. For a long time the Undertaker was stuck feuding with guys who didn’t have any strong in-ring ability and these feuds were usually paid off with lackluster matches. So, when Mankind came in and showcased skills that worked very well with the Undertaker’s style, it was refreshing to see. Their feud was lengthy and intense for 1996 standards. It didn’t feel like it dragged on and Mankind was a legitimate threat to the Undertaker in every match they had because of how strong he was presented in the early stages of his career in the WWF. These two never failed in having a quality match. 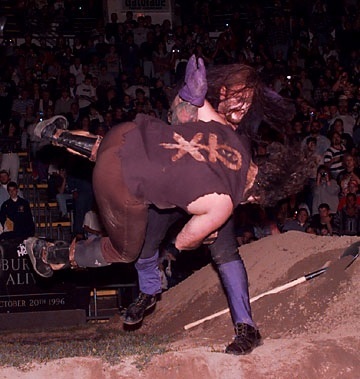 Yes, the KOTR 1998 match was more of a match based off of a few crazy spots, but it is still memorable and entertaining. It would be time well spent if people went back and watched their feud from the beginning. It was one of the few bright spots that the WWF had in 1996, honestly. What are your memories of the feud between Mankind and the Undertaker? Did you enjoy it or did you dislike it? Feel free to share your thoughts on our Facebook page.